More Drunkards Path for the Museum Medallion! Only 14 13 more to go! 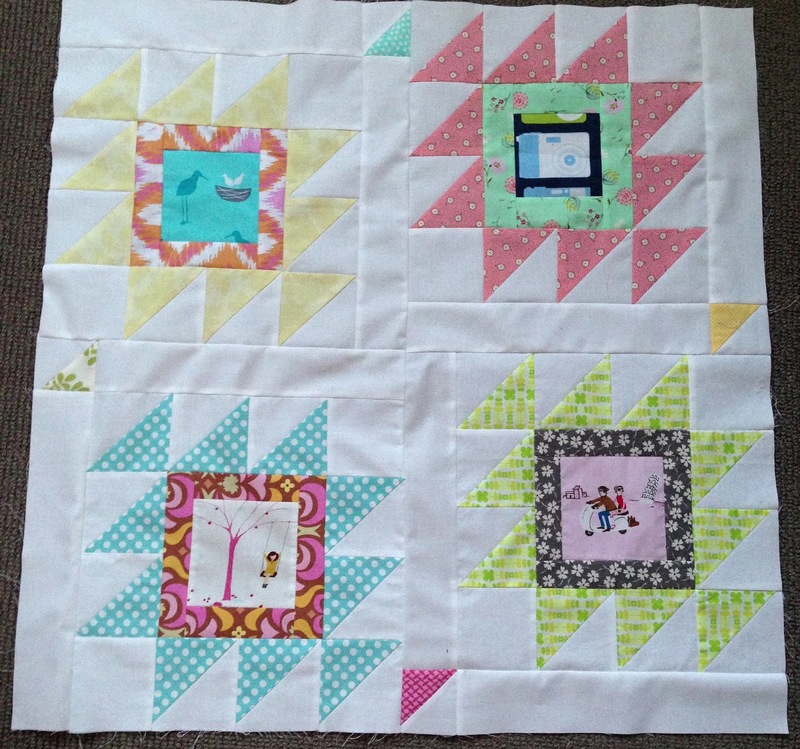 Utterly in love with Annes bee blocks! Your drunkard's path blocks look perfect and I really like the Bee Blocks. They look lovley. You added another border to the Rocky Mountain Blocks? So creative!! I love how they fit together now. Although you don't seem too impressed. I can't wait to see more. love all you project blocks. I love those Rocky Mountain blocks!! Great colours and such a fresh looking design - you'll love it too once you see more of it together. You always have so much color going on. I love that! And those drunkard's path blocks are looking a lot like Spring. Coming to your blog is always like a refresing breath of fresh air, both in color and style. I need to get sewing on Anne's blocks; yours give me inspiration! Fun to see all the other ones come along, too. refresing=refreshing. I probably shouldn't write so early in the morning, and before breakfast! Your blocks are pieced so perfectly. Love the colors!! I love it all, especially the Drunkards path blocks, I must try those soon. 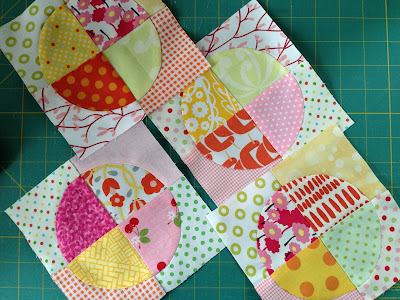 I love the bee blocks - they look so perfectly pieced! Beautiful blocks. I especially love the drunkards path block - gorgeous! Great projects. I really like the Rocky Mountain blocks. What don't you like about your bee blocks? Everything looks wonderful to me, and I'm getting the urge to do DPs again, thanks. I love all your beautiful, colourful blocks! Cindy's bag is a treasure. I don't understand why you are reserving judgement on your Rocky Road blocks? I like the way you are setting them. Gorgeous stuff as always! 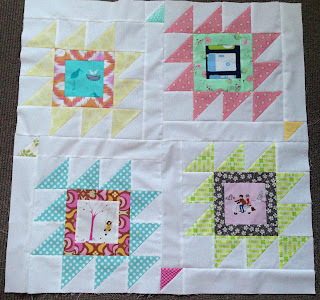 I agree with Rachael though - I love the setting your using for your blocks too, those little hsts are genius! Gorgeous blocks. Especially the curves - do you hand piece those? And love your setting for the Rocky Road - go for it! Ohhhhh! 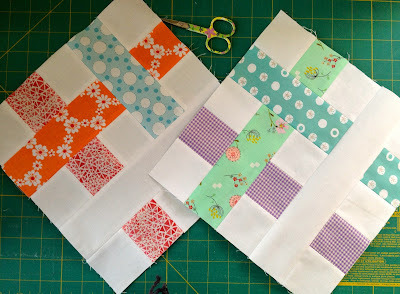 I love the bee blocks...now I need to get cracking on mine! 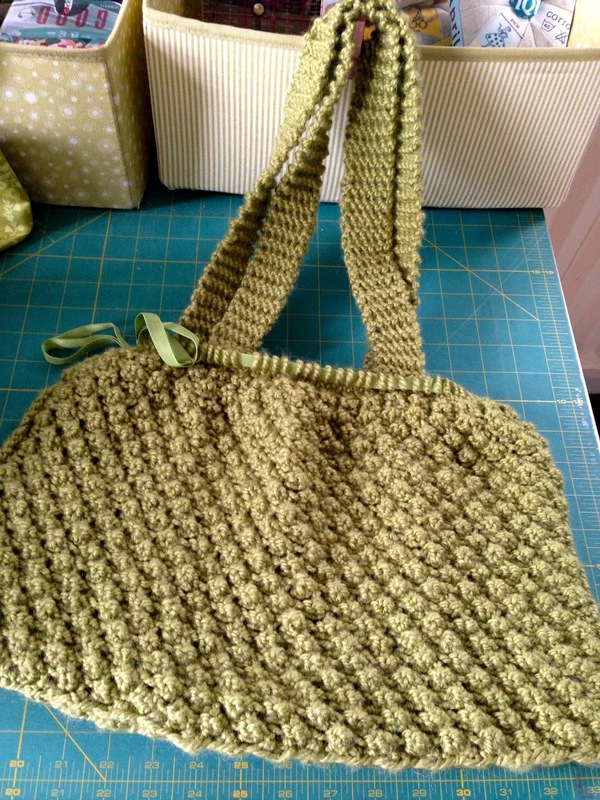 And how sweet to receive a knitted bag! I love the Rocky Mountain block. That was a good choice for a bee. Want to meet in England sometime? I think I can persuade Clare into hosting! LOL!!!! Suz, the step setting for the Rocky Mountain blocks is so genius, I think! And your MMBlocks really make me want to get busy and make mine! I love how my MCM bee blocks look . . . can't wait to get them. And your Drunkard's blocks are great. Such fun fabrics. More lovely blocks. I am really liking the DP blocks. I think the rocky mt blocks will show their true character when there are quite a few together. Good luck! The consensus seems to be that the Rocky Mountain blocks are perfect. I like the fact that you don't immediately see how the blocks are joined together - I had to work it out where the sashing was, which makes it interesting. Dare I ask about quilting ideas? Your blocks are great. You are so productive I wonder what I do with my time. Love the Rocky Mountain blocks. If you don't like those Rocky Mountain Road blocks in ice cream colours - send them here - I adore them! Your bee blocks for Anne are looking interesting. You always seem to have several projects on the go, never a dull moment. Absolutely love those Bee blocks! Looks like you are having real fun. Loved seeing all your blocks....and I especially love the drunkard's path blocks. I always enjoy seeing what you are making! It has been a busy week at my house as I am only here on Sunday. I love the blocks for Anne, and your circles. The knitted purse needed a nice lining and I hope it is lovely now. I see one of the Rocky Mountain blocks I made, I love how you are sashing them, I am looking forward to seeing how the quilt comes together. I've been seeing a lot of "plaid" quilt blocks popping up and they are all fun. Your other projects are looking good. I think sashing the Rocky Mountain blocks adds a nice touch. Oh! 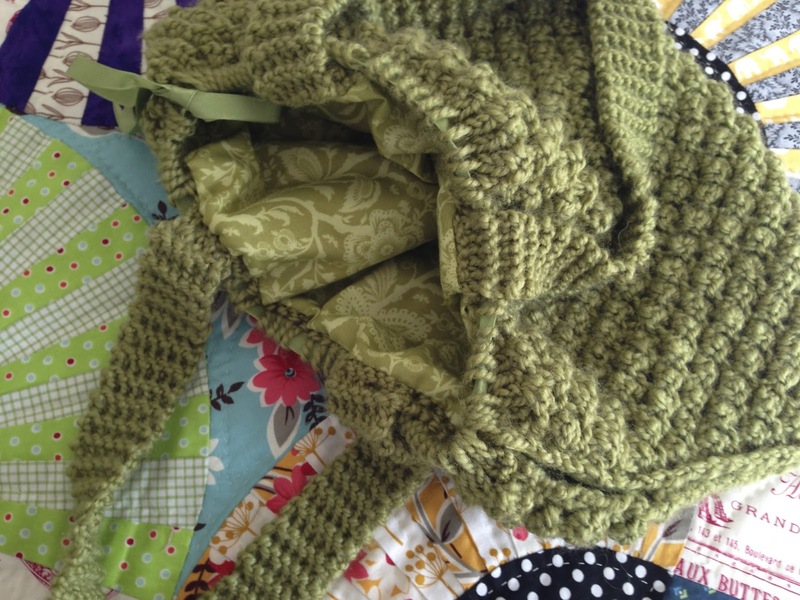 Those bee blocks for Anne are gorgeous! Great colors. It was a fun block to sew, wasn't it? Even though I must admit that I messed it up twice and had to recut several strips. I forgot to put on my thinking cap before making it. You're making pretty museum blocks too.